The famous clock company Richard Mille decided to challenge the monopoly on tipping Reverso and polo players to offer their model. 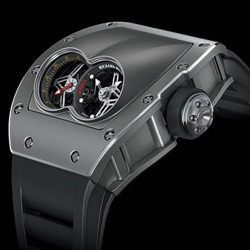 The new RM 053 hours Pablo Mac Donough not just focus on the well-known polo player, as the name implies, but constructed entirely unique way. These watches are specially made so that would not only protect the face from blows during a game of polo, but also watch them on time during the game did not turn his hand. 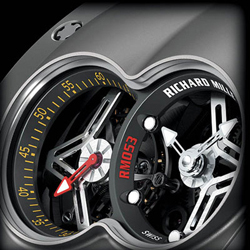 This engineer Richard Mille has been achieved thanks to 30-degree slope of the whole mechanism, and hence the clock face. As a result, the testimony clearly visible even at lowered his hand and face also protected by special arches. Watch case with RM 053 Pablo Mac Donough made of titanium carbide. Its shape overturned all notions of the classical image of hours with barrel housing. Located on the right window are measured in hours and minutes, and the left is the tourbillon, which is fixed on a carriage red second hand. Water-resistant watch is 50 meters. Hours are named after the polo player named Pablo McDonough. In 2010 he was named the best player, and last year received the team Richard Mille Polo Team. The new RM 053 hours Pablo Mac Donough released limited edition of 15 copies. Through the transparent back cover you can admire the unique tilted clockwork novelty.